Dolphins are the nerds of the undersea world. They always study for tests. 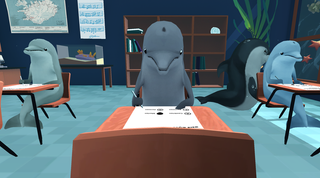 In a new virtual reality game, you're a human exchange student who hasn't prepared. So you're going to have to cheat off those uppity bottle-nosed mammals. Don't get caught or their squealing will make your ears bleed. So long and thanks for all the answers, Flipper! Classroom Aquatic puts players inside an entire semester on the ocean floor and challenges them to get good grades without studying one damn bit. It's being designed for the Oculus Rift, which means it'll provide the opportunity for you to wear virtual reality headgear and yell out at aquatic lifeforms whenever you want. Developer Sunken Places has just launched a crowdfunding effort to help get the game done. It's a safe bet that no dolphins will be contributing to it.